For one (glorious?) 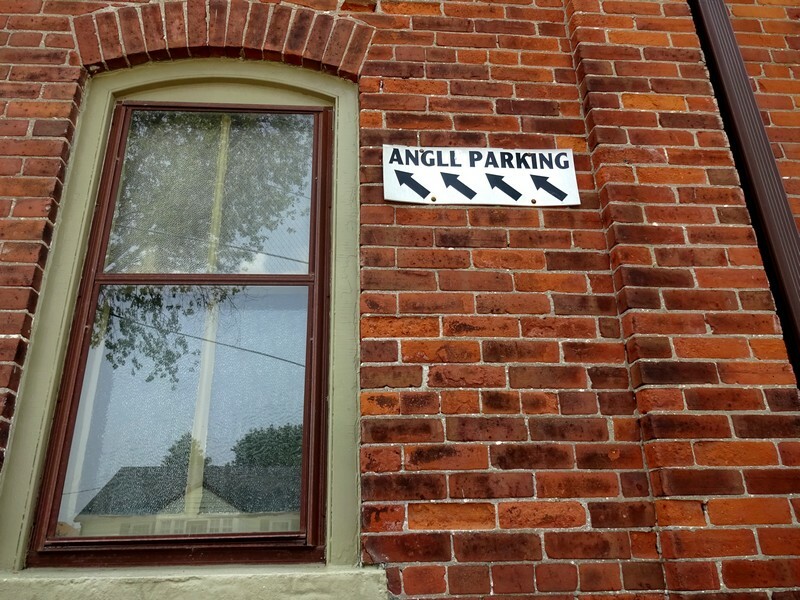 moment I thought it said “ANGEL Parking). Even without the promise of a Manifestation this is a great catch. How the reflected power lines echo the parking arrows, how the upright lines of window and drainpipe balance one another, how the reflected house and tree give a sense of openness to balance the “blunt” feeling of the splendid brick wall. All so satisfying. Angel, Angel? Or? Who can park there? Another wonderful observation by you Carin! I love the soft focus house and tree in the reflection against the straight lines of the brick and window. I took another shot, different ‘angll’ as it were, but it didn’t include the window. I agree, I like that contrast too, with the brick. Thanks, Allison! What a great chuckle, Carin. Wherever did you spot this sign? Somewhere in your travels I suppose, where this is the way to spell ‘angle’. Yes, on our travels. We parked there. But not on an Angll I’m afraid. The comments remind me of whatever pope it was who said “Not Angles but angels” on seeing some beautiful Anglo-Saxon children for sale in a slave market. And I love all the lines and patterns in the photo. You know the weirdest things. And I say that with admiration. Googling that pope!